I told you they were coming to see me! Bonjour, my loyal friends! Did I mention my parents were coming??? Sawyer and I were so happy to see new people we almost couldn’t stand it. I was getting pretty sick of me, and I think the dog was, too. And poor Martha was really tired of Sawyer and me jumping up to lick her face when she walked in the door from school. Mom and Dad were pretty stoked to see us, as well, even if Mom doesn’t look like it in the above photo. 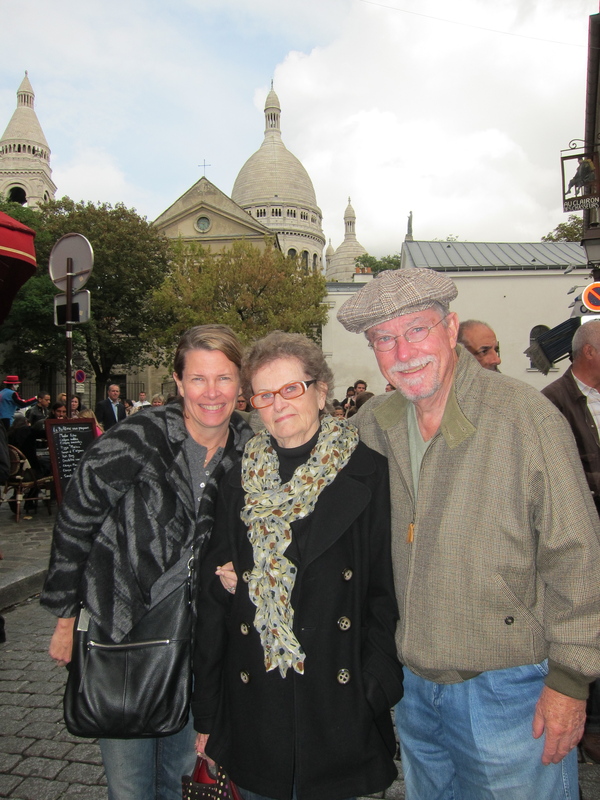 Blame it on jet lag- this was the afternoon of their arrival and we were schlepping around Sacre Coeur in the drizzle. I was the only one of the four of us (Mark was the photographer) who wasn’t jet lagged, and it kind of reminded me of being the only sober one at a party. Or, what I would think that would be like. I would much rather be drunk than jet lagged, though. Wait, where was I going with this? Oh yeah- they were all bleary eyed and yawning and occasionally babbling nonsense, and after awhile I started feeling like I had just stayed up all night, too. Weird. They arrived over a week ago and we have been movin’ and shakin’ and covering some ground. This morning they boarded the fast train to Avignon for a few days, and I came home to play catch up. I guess I am not a very good multi-tasker, because the housework, French studying, grocery shopping, and oh yeah- BLOGGING- have gone to s*it since I have been wearing my hostess cap. I really intended to make a bigger dent cleaning up this joint today , but Mark just left me a message that I needed to update my blog, so I guess the dog hair and general disarray can wait. I think Mark is worried that you guys will all abandon me and start reading a blog about tennis or life on an Oklahoma cattle ranch or something (right- like THAT would ever happen ) and then I would be all depressed and weepy and he would feel like he had to buy me something and it would all go downhill from there. So you can thank him for today’s post (or blame him, depending on how this post turns out). Amazingly, the Sunday they arrived was the only drizzly day we have had so far. Monday morning they woke refreshed and we took a self-guided walking tour in the Marais. We found ourselves in the very chi-chi Place de Vosges, which was built by Henry IV in 1608 and called the Place Royal. 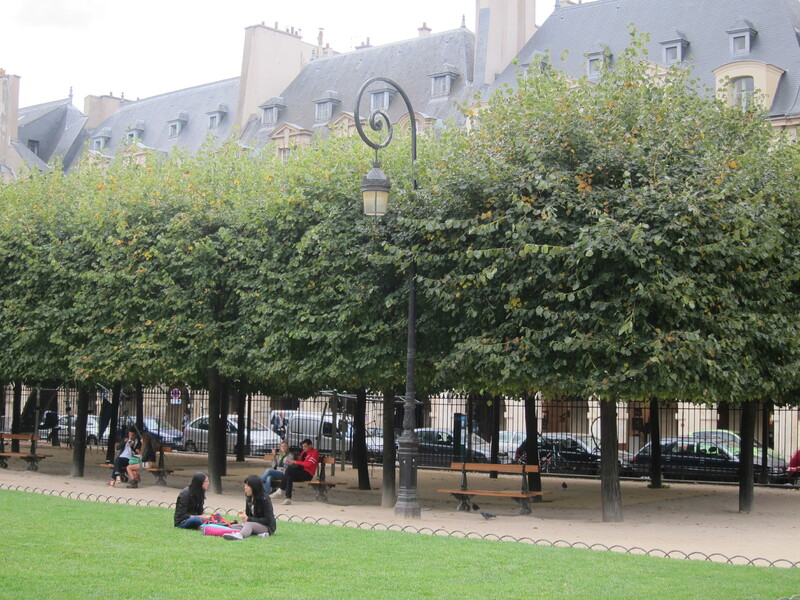 This was Paris’ first square, and was the site of duels and tournaments. It is lined by nine symmetrical houses on each side, with slate roofs and dormer windows over arcades, and is gorgeous. Henry IV lived here, as did Victor Hugo (but not at the same time). The Place Royal was the home of the aristocracy and is still very prestigious real estate. You may have heard of one of today’s residents- Dominique Strauss-Kahn? Well, I think that’s where he lives, anyway. My French teacher told me he did, but she may have said he once dated several women who lived there. Never really sure how much of what she says I am understanding, but I smile and nod and say “oui” a lot, and it seems to work. 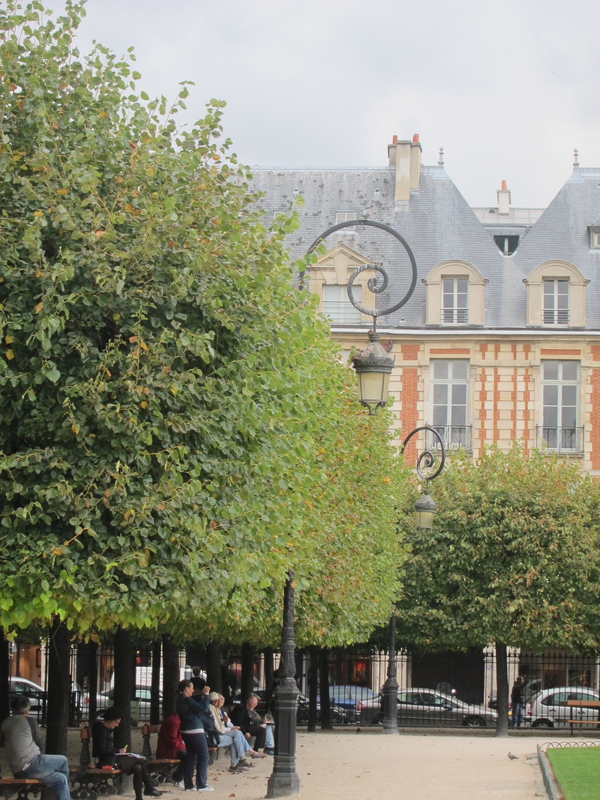 Rows of trees line the outside of the green area of the Place de Vosges. This photo reminds me that we ate lunch at a cafe under this arcade, and the people next to us were eating blood sausage that was almost black. There was also a woman eating a bowl of what appeared to be raw hamburger meat with a sprinkling of vegetables on top. Whew- and I thought I was making great strides in learning to eat olives here. This is going to be harder than I thought. Never leave me, friends, even when I get distracted with other things or quote completely inaccurate facts. 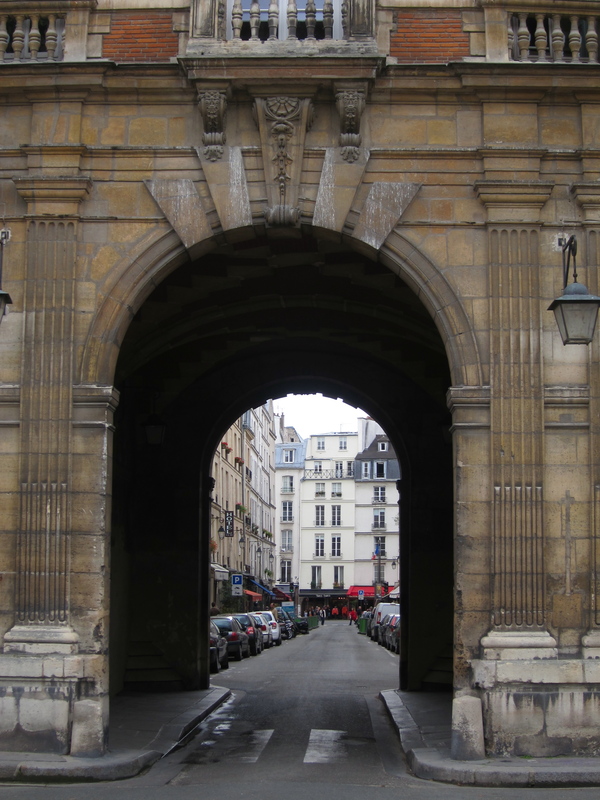 There is an abundance of blogs that give really good historical background on Parisian sites. This is not one of them. I’m not sending my parents back to Texas until it quits getting to 100 degrees in Austin. Hear that, Texas? Yeah for Mark! There are two reasons I am glad he got you to write your blog instead of removing the dog hair: 1) I really enjoy your blogs; and 2) I won’t feel so bad about the piles of dog hair in my house. I am sure you are the perfect Paris hostess for your parents. Did they fly coach? I guess they survived that experience? Enjoy! So happy I could make you feel good about your dog hair! I feel like i owe it to my friends to be perfectly candid about the dog hair issue in my apartment, in case they have a problem with that and would rather book a hotel room in Paris! Love your Blog. It’s like a mini trip to Paris every time. Glad your parents are having a good time! Merci, Kathy! How is the empty nest???? Cute picture with the parents! 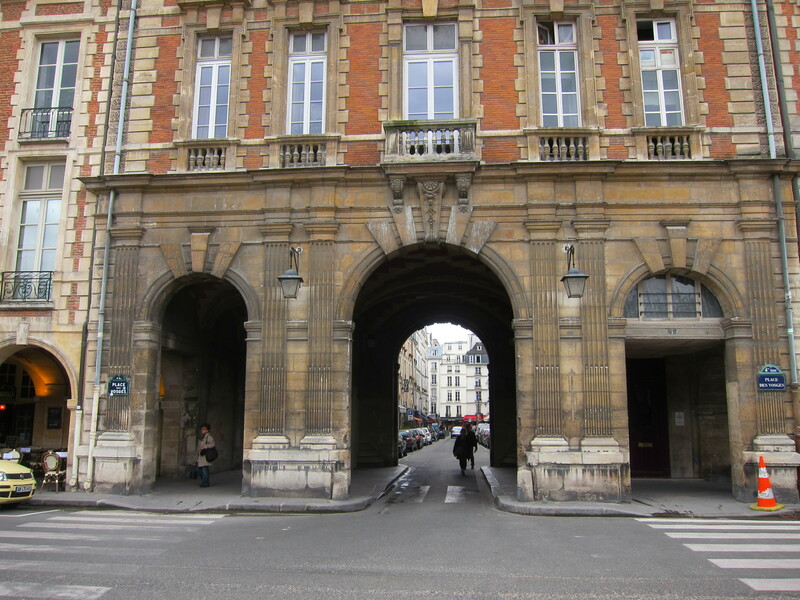 And so right about the Place des Vosges. It is sooooooo breathtakingly beautiful. Had forgotten that. 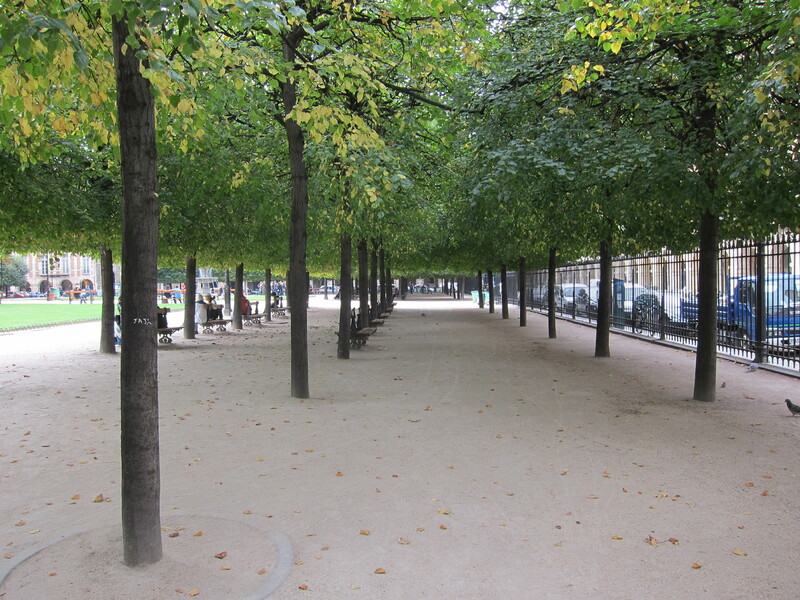 But the next time I get to Paris, I’m going to make sure to take a nice walk round there again. Btw, I, for one will continue to read your blog as it really is much more entertaining that any dusty cattle ranch in Oklahoma blogs I’ve ever read (wink, wink). Tell your parents to make no plans to leave Paris anytime soon as the heat does not appear to want to let up at all. Where has the autumn gone? Or was there ever one in South Texas? Yes, that is a rhetorical question. Keep having fun along the streets of Paris and stay away from blood sausage. Yucky! What lovely sights. Glad you are back in the saddle! Another record temp. expected here today, i.e. 97 F which for all your French friends is 36 C.
Glad to hear you are all having a wonderful time! It’s been strange not having your parents just a phone call away; I guess you know the feeling. Enjoy your last week with them. I think they’ll come home to 90’s, as long as they stay there through the weekend. Big hugs to all of you! I’ve decided to cook soup tonight, because I’m convinced it will never get below 90 degrees in Houston again! I’ll just turn my AC down and enjoy, until I get the electric bill anyway! Have a great time with your parents!! You must get the real dirt on DSK while you are there. Since I don’t read Kim’s tennis blogs, I do a crazy thing like read the newspaper. Even though the maid was discredited, I think DSK still sounds like a dirtbag. But that’s just me! Tell your parents it has RAINED here FOUR times since they’ve left!!!! Not enough to really help but clouds and moisture count here. I enjoy your blog and you enjoy your mom & dad!!! !